I knew cheeses check the first two boxes, but I was thinking, what about the third one? After researching, I've found that some cheese types (mostly hard & dry ones) actually originated WAY BEFORE than true invention of refrigeration although most of the time they were waxed, kept in cool locations and sun exposure was avoided at all costs. More, most hard & dry cheeses are aged intentionally (for example this Parmigiano Reggiano) since the more aging is there the harder & drier the cheese will get. While hiking, I'd avoid soft cheeses since they turn quicker and would absolutely go for hard and dry cheeses such as Cheddar, Parmesan and Gouda. I'd also avoid shredding the cheese as it speeds up the aging process (due to increased surface area and hence more air & bacteria exposure). Regardless, I'd ALWAYS store them in a parchment paper or a paper bag (NOT a plastic bag!) because the porous surface allows cheese to breathe (even more important in warmer weather as paper soaks a bit of vinegar when cheese starts getting oily) and helps with keeping its flavor. Still, avoid storing them around too hot locations of your backpack and avoid sun exposure. In my opinion, considering all these, the best cheese for backpacking is this waxed cheddar cheese (half a pound)​ and this Parmigiano Reggiano​. Does cheddar cheese need to be refrigerated? How long can shredded cheese sit out? How to tell if the cheese is going bad? With so many types of cheese available today, there is no one standard according to which they can be categorized. Different experts consider different variables, for example, country of origin, milk used, aging, texture etc. and logically, experts fail to agree on a standard system that categorizes cheese unequivocally. However, the following taxonomy of cheese has been made according to their firmness. Firmness is affected by the level of moisture each cheese contains and varies between 30-80% with hard and fresh cheeses on either ends of the scale respectively. The greater the moisture level the lower the shelf life. If you're having trouble putting a name to these types, examples of some common cheeses that belong to these groups. Fresh cheese: Cottage Cheese, Ricotta, Mascarpone, Cream Cheese, Quark. Most shelf stable cheeses are HARD and DRY ones such as Cheddar, Parmesan, Gouda, Asiago and Romano. They DON'T REQUIRE REFRIGERATION and depending on the other factors (hardness level, storage conditions, making process), they can sit out happily on the shelf for months or sometimes even years at room temperature - but I'd eat them in 1-2 few weeks (longer than enough for a backpacking trip!). Regardless, in most (not all) conditions, cheeses will last longer in refrigerator - so I'd keep them there until packing. Provided that these cheeses aren't just about to turn, there isn't any danger to take them with you. "So what about the unrefrigerated lives? GIVE ME NUMBERS!!!" Unfortunately, it isn't too difficult but impossible to give exact numbers for this as it depends on way too many uncontrollable factors as already mentioned earlier in the article. I did my best to explain, will mention how to tell if cheese is going bad later in the article, and I'd doubt you can find more direct answers to these questions. If you do find though... Make sure to check the references & credibility. As explained earlier, no; it mostly doesn’t unless it has only a few days for it to turn (duh). But since the refrigeration without the extra moisture will almost always increases the life of cheeses - I'd keep them in the fridge until packing. 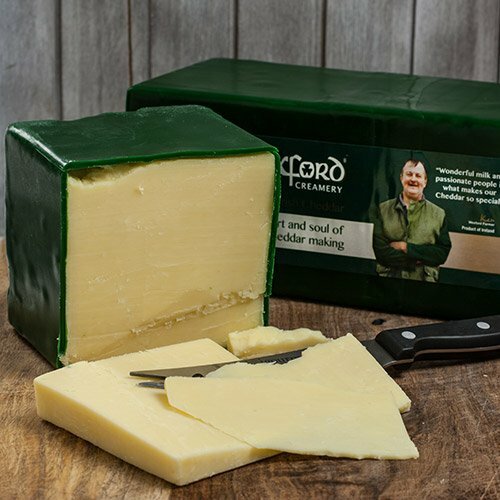 Cheddar is a very popular cheese and luckily, it's a hard cheese. VERY roughly speaking, it has an average shelf life of around 2 months. Unfortunately, for those of us who like to experiment with cheese and use it in recipes, this fact is unwelcome news. Shredding cheese drastically reduces its shelf life as shredded cheese offers mold a greater amount of surface area. So, if even one shred of cheese gets contaminated in the container, it's best to throw the whole container away. This is another thing that's impossible to give exact numbers - which is why I just simply wouldn't shred the cheese while going on a backpacking trip. Now all this knowledge regarding the composition and types of cheeses is probably useless if you don’t know how to keep your cheese fresh as long as possible and hence this step is extremely important. The paper should be replaced after every unwrap. Sometimes cheeses will sweat more, so it's better to use a new wrap each time. Jot the date and type and only buy what you need. It's recommended that you mark the date and the type of cheese on the container right after buying. It helps you keep track of its shelf life. Use oil to curb mold. This is a neat trick if you want to let go of wraps. You can coat the surface with olive oil and store it in an air-tight container. So, if mold grows, it will be on the surface and not the cheese itself. NEVER cut the big cheese piece into smaller pieces. The increased surface area will bring about more air & bacteria exposure and will speed up the "turning" pace. It's considered an urban myth that expiration dates on food products are not an exact and reliable method of indicating whether a food product is safe for consumption as most products can be consumed even after the “best before” date. In the case of cheese, this is even more relevant. Telling whether cheese has gone bad requires one to be a bit more meticulous as you can’t rely on the typical indicators of rotten food. But a general rule of thumb for cheese is to look for mold. Another indicator can be the taste of ‘sour milk’, cheese that tastes funny or reminds you of spoiled milk is likely to have gone bad. Cheese with a greater amount of moisture are vulnerable to being tarnished, that’s why soft cheese perish more readily than hard cheese. ​In the case of hard cheese, it's generally considered edible if you cut off the part that carries the mold. However, if the rind is dry & yellow and if it gives off an ammonia-like smell, I'd simply throw away the whole block. With soft cheese, it's better to err on the side of caution dump the whole loaf altogether if it starts to smell, appear of taste differently. The best cheeses, of course, are hard and dry cheeses because of their quite long shelf lives. But, cheddar cheese might be the best pick as it's versatile: Can be used for meal toppings and snacking. It's fatty and so contains a good source of fuel for longer hikes. Also, it can be paired with a large array of food items, something that is very hard to do with Parmesan. I hope this backpacking cheese guide was helpful for you to understand whether packing it is for you or not. Thank you for reading and happy trails!